This video originally appeared in the September 1, 2018, edition of AMA's webcast: AMA Air. Find more episodes at http://air.modelaircraft.org. Looking back at more than 100 years of manned aviation and 100-plus years of model aviation, we find that the two endeavors are unequivocally intertwined. Model aviation is often the forerunner in new designs and becomes the proving ground of new technologies. When innovations emerge in the manned-aviation community, they soon follow in model aviation by way of modelers emulating what is seen in full-scale aviation. As we approach a pivotal point in aviation history, with the emergence of new technology that will forever change the shape of the industry, we see model aviation again leading the way in the design and application of new technology. The one constant in this equation is the youth of America and their unbridled ingenuity and creativity. For decades, model aviation has served as a seedbed for the scientist, engineers, and pilots of tomorrow. Hundreds of thousands of successful careers in the aerospace industry had their beginnings with model aircraft and the appeal of taking flight. For 82 years, the Academy of Model Aeronautics and its members have been instrumental in teaching, promoting, and nurturing youth down the path to careers in aviation, and AMA continues to play a crucial role in unlocking imagination and creativity. Throughout the years, AMA has developed dozens of programs aimed at stimulating youth involvement in model aviation—everything from the simple make-and-take model-building workshops to more sophisticated programs that walk kids through the process of building and flying model airplanes. AMA’s STEM programs go a step further in demonstrating how model aviation relates to the broader principles and applications in science and technology. One such program—and perhaps the pinnacle of AMA’s educational activities—is the UAS4STEM program. Aimed at middle school and high school students, this program encourages the formulation of teams to compete in head-to-head contests involving building, programming, and operating unmanned aircraft in a real-world scenario. It captivates youth by creating a perfect storm of intrigue through the combination of aeronautics, computer science, and robotics. It takes the video game world to which kids have become accustomed and translates it into a hands-on experience. This year, more than 70 teams from across the country competed in local and regional competitions, vying for a chance to attend the UAS4STEM national competition at AMA’s International Aeromodeling Center in Muncie, Indiana. 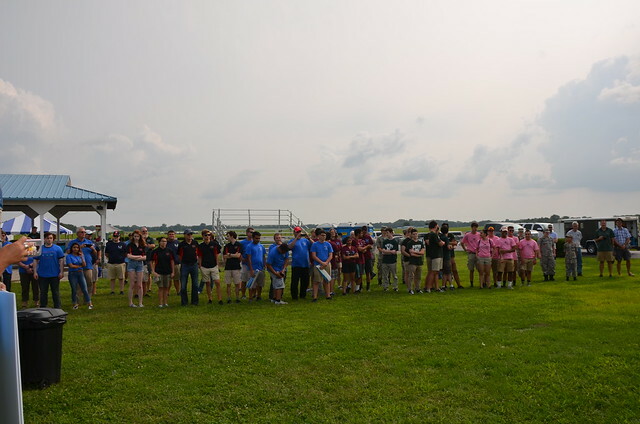 On August 18, 2018, eight teams competed for the national UAS4STEM title. With the completion of the yearlong contest and the start of a new school year, teams will once again form for next year’s UAS4STEM competition. Finishing first in this year’s competition were returning champions, the McIntosh Multi-Rotor Team (MMRT), from Peachtree City GA (center). The second-place finishers, the Quadobots team, is from Great Mills MD (right). Finishing third was St. Mary’s Civil Air Patrol from Leonardtown MD (left). I want to encourage all AMA clubs—especially Leader Clubs—to support this extremely important program by opening your flying sites to local UAS4STEM teams, allowing them to develop and test-fly their aircraft, and perhaps by sponsoring a team under your club’s name and possibly sending your team to the national fly-offs in 2019.